Special incentives for buyer - call/text 571-494-1245 or email Shawn@1245team.com or NateJohnson@1245team.com to check on buyer incentives and schedule your private showing! Spacious 3 bedroom/3 bathroom Villa located in Celebration Virginia! This home features all the upgrades you want: hardwood floors, crown molding, upgraded bathrooms, handicap-accessible entrance, & maintenance-free rear deck. Gourmet Kitchen:double oven,gas cooktop,hood,pullout cabiets&quartz countertops. Near Motts Run Reservoir recreation area, Rt 17 & I-95. We really love the Fredericksburg location of being halfway between the Virginia State Capital and the Nation’s Capital. 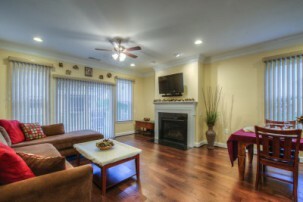 We have been able to take advantage of theatre and shopping in both locales. During the Christmas season, a visit to the National Mall is a treat. Conversely, the Lewis Ginter Botanical Gardens in Richmond is very nice with their Christmas light display. In the Fredericksburg area, we have visited the National Civil War battlefields and found them very interesting. Being located just of US17 has allowed us to quickly travel to the Shenandoah Valley and enjoy hiking along the many trails located in the National Park. Also, the number of Virginia wineries is growing in our area and have also been wonderful to visit. Just off US17 are some great restaurants, locally owned and operated. Vinnys Italian Café is our favorite pizza pie and eggplant parmesan retreat. Aladdin’s has great Mediterranean food with an awesome chicken gyro! We also have a great Chinese restaurant called Hunan House and a new Japanese Bistro called Quickway. Of course the normal fast food eateries are just a short drive away as well. The Del Webb, our neighborhood, lifestyle is absolutely great! The clubhouse and fitness center is superb. There are so many activities occurring every day and each week, once cannot possibly do all of them! The social events, especially during the Holiday Season, are really nice and getting to know your neighbors and visiting with them during these events has provided real community connections. Everyone is so friendly and watches out for each other, it is like living among family. 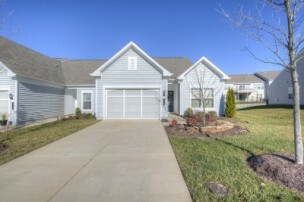 The drive along Celebrate VA Parkway into the community is a relaxing and peaceful commute. Living here is like living in an oasis from the rest of the world! The peacefulness of the area was the key for us. The villa home is quiet and having the dual master bedrooms was an added feature with having my aging Mother with us. The upstairs loft allowed her to have her own retreat, while we were able to enjoy the main floor with room for guests. The location allowed me to remain active with my government service and local church. Lastly, at the time we looked at our home, the sun was rising and the rear east-facing deck and morning sun warming the kitchen area was an invitation to stop, relax, and enjoy the provided Providence. Our home is loaded with so many features! We love the built-in humidifier with the heating system during the winter. The remote controlled fireplace is also a nice feature. As a practical matter, the peace of mind of having a whole house fire suppression system has allowed us to sleep well at night. Having dual master suites is a nice feature for any adult working couple with an aging parent, which was the draw for us to move to a Del Webb community with our children being out on their own. The added pleasure of a maintenance free yard was so nice during the spring and summer months. Our Burlington model end unit also has a private office area or can feature as a den.